I measured self potentials in the visinity area of Crater I in order to know the change of volcanic activety in this area. I had measured self potential between 2013 and 2015 previously and I can compare the data and might know the changes of volcanic activities. 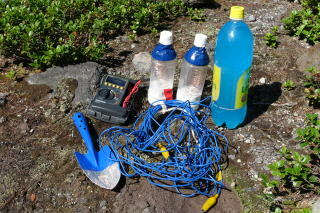 I used two plastic bottle electrodes and multimeter tester and electronic cable. 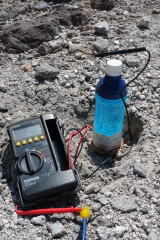 I put those electrodes on the ground and measured voltages. I walked up and down the mountain side with large rocks under the sun shine.